The embolization coil refers to endovascular intervention technique used for treatment of intracranial ruptured or unruptured aneurysms and other disorders. The swift development of embolization techniques have permitted endovascular treatment to be applied on more complex aneurysms those were initially impossible to treat via traditional endovascular techniques. However, it is still difficult to apply this endovascular treatment method on a small branch-incorporated aneurysm. Paradigm shift from clipping to coiling and gradually towards non-coiling techniques has opened doors of opportunities in global embolization coil market. The market is expected to reach over $1 billion by 2023 from $639.3 million in 2013, growing at a CAGR of 4.7% over the forecast period. Rising demand for minimally invasive surgery is the major factor driving the global market growth. North America was the largest market in the global embolization coil market followed by Asia-Pacific. Asia-Pacific is projected to register highest CAGR during the forecast period. Based on deployment type, the global embolization coil market is segmented into detachable coils and pushable coils. The detachable coils accounted for largest share among both types in 2015; however, pushable coils segment is expected to surpass detachable type over the forecast period. 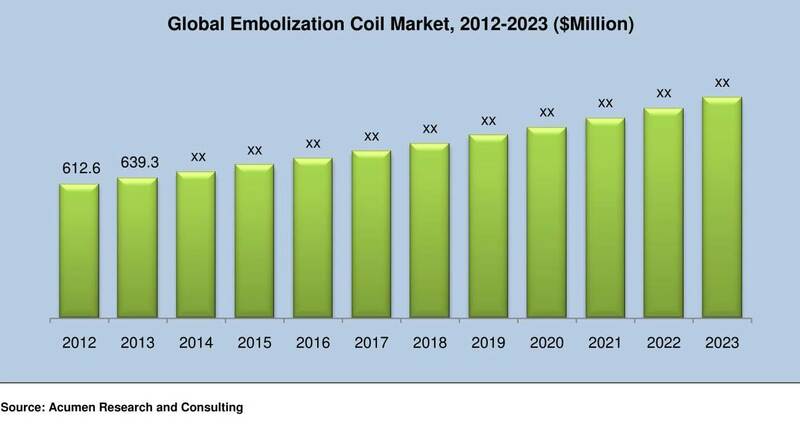 Further, a number of global manufacturers are expected to promote the use of embolization devices and, in turn, are expected to increase the adoption of embolization coils. Western Europe is expected to be second largest market followed by North America. This growth is mainly attributed by the rising awareness towards the use of peripheral embolization devices for curing various diseases such as cardiovascular and bleeding disorders. Factors such as the presence of huge patient population for target diseases, government initiatives to develop healthcare infrastructure, growing awareness among neurosurgeons towards the benefits offered by interventional neurology devices, and rising acceptance of neurovascular devices are expected to drive the market in Asia-Pacific.